*Beginning March 2019 a 6 passenger golf cart will be provided with this property. LOCATION: This home is located steps away from the beach and walking distance to Grayton's local dining, such as The Red Bar and Chiringo. DETAILS: Welcome to "A Wave From It All" a beautiful, four story, six bedroom vacation home located in the funky and fun community of Grayton Beach. This home was recently featured in the Visit South Walton "Your Home Away from Home" which highlights South Walton as our one-of-a-kind destination offering totally unique accommodations to fit any style. "A Wave From It All" is certainly a one-of-a-kind beach front home featuring a spacious top-floor living space with an open living room and gourmet kitchen fit for a chef. With endless Beach and sunset views, "A Wave From It All" is sure to leave you with incredible vacation memories and it's a perfect beach retreat for large groups. 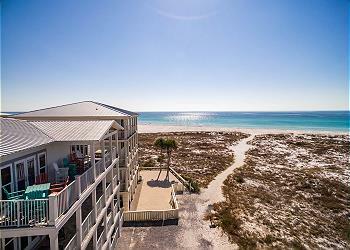 Easily walk out to the beach and enjoy the emerald waters of the Gulf of Mexico. When you are ready to get out of the Florida sun, make a splash in the homes private pool! Guests will love this homes convenient location to the vibrant Grayton Beach nightlife with the Red Bar and other dining options located nearby. OTHER AMENITIES INCLUDE: 5 adult bikes provided, private pool. This property comes with 5 dedicated parking spots. Complete Clean Linen Participant - ALL linens, including comforters laundered upon every checkout. Please note this property is in close proximity to local dining establishments. The food is fantastic and the atmosphere is lively! 9 adults and 7 kids spent 4 nights over Thanksgiving, INCLUDING the cooking of the traditional meal. No issues with kitchen supplies, but we brought lots of our own. Gas stove doesn’t get a giant stockpot to boil without quite a wait, but it was worth it to stay in such a lovely home. Elevator was imperative for the older folks in our group. It worked great! Beds were super comfy. Pillows and linens were great. Decor was beach but classy and minimalist. Soothing colors. TVs were top notch. Proximity to Red Bar cannot be beat!! Everyone was able to escape to their private quarters when togetherness was overwhelming. Ice maker on ground level was loved. Beautiful sunsets from all balconies. Kids hung out around pool table and had a blast. Bikes were a hit. Heated pool. I mean, really, no stone was unturned!!! I would love to stay here again and will recommend it HIGHLY to anyone looking, including 360. Great service from realty company. Exemplary. 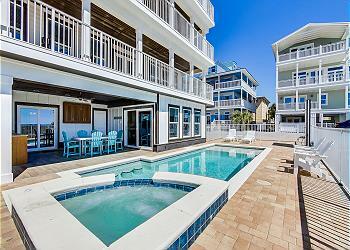 We are so thrilled that you and your family had such a great time with us in Grayton Beach! We could not agree more, this home is perfect for larger groups and the location is second to none! Thank you for staying with 360 Blue, we hope to see you again soon! What a wonderful house. We had a fantastic time! We are so glad that you enjoyed this home and your vacation! The photo you shared is beautiful! We look forward to seeing you again very soon! I absolutely loved the home we stayed in! It was super clean, tons of room and easy access to everything Grayton Beach has to offer. My only issues are the construction next door and behind us the entire time. All day every day we were subjected to moving cars and having to rearrange cars to help with trucks coming to the house next to us. We are so glad you enjoyed the home and had a great vacation! We apologize for the construction you had to deal with. Our area is always expanding! We hope you are able to come down and visit again soon! This house was great! Right on the beach, beautiful ocean views from any of the large balconies, and plenty of space for our group of 6. Kitchen was well stocked, as were the bathrooms with plenty of towels and extra bedding (there’s also a pack-n-play available if you need). The service at 360 Blue was incredibly helpful and responsive for all our additional needs. While the pool was somewhat small, it was a nice convenience for the couple of days that we wanted to splash around after the beach. And even though cars are permitted to park on this area of the public beach, the daily chair service was set up in an area away from all the vehicles and right beside the lifeguard station. Being walking distance from Chiringo and Red Bar was also really nice. We absolutely love Grayton Beach and will definitely come back to stay here at A Wave From It All. Thank you for making our vacation so lovely! 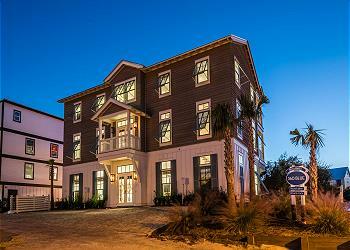 We are beyond thrilled that you enjoyed your stay with us in Grayton Beach! We agree that this home and area is a hard one to beat! We look forward to seeing you at "A wave from it all" again soon! “A Wave From It All” was the perfect spot for our reunion. What a fabulous place! I came with 11 friends from college and everyone loved the house. We have been going to Beach together for 31 years and this was by far our favorite spot! The house is lovely with lots of comfortable beds for all. The view from the porch is incredible so we didn’t go far! Just steps from The Red Bar made it really fun as well. 360 Blue was so welcoming and accommodating and quick to respond when we had a need. Your house is a little piece of heaven on earth and we plan to come back again!! We are overjoyed with how wonderful your time was here in Grayton Beach. We love this home as well and Grayton is one of our favorite spots! We look forward to hosting you and your friends and family again! We had 13 people in our group. We were here to celebrate a 75th birthday. We enjoyed the red bar. The view was absolutely beautiful as well as the sunsets. The kids enjoyed the heated pool as the weather turned cold as well as the pool table. We had a few things that needed attended to and 360 blue was extremely fast in taking care of any request we made. Really enjoyable visit. What an incredible photo! The views and sunsets from this amazing home are truly spectacular. We are thrilled that you enjoyed your stay and we hope to see you back at the beach soon! Such a lovely place! The views were amazing and it was extremely close to the ocean. Very clean. I loved that it came with bicycles already at the unit. We will stay again in the future! P.S.- We loved that the house was also next to a river that met the ocean... the kids had a blast kayaking and looking at the wildlife that the river and dunes brought with it (pictured above). This photo practically oozes relaxation! We are so happy to hear that you enjoyed your stay and the property so thoroughly! We are delighted you could take advantage of the complimentary bikes with the property and the easy access to the river! Thank you so much for choosing 360 Blue for your beach vacation and taking a moment to share your experience with. Be sure to visit us again soon! Family beach vacation with three generations... We had a wonderful week at "A Wave from It All". The house was comfortable for the 13 of us and provided enough space and privacy for 5 families. We did have problems with roaches. 360 Blue sent pest control after our first call and followed up after. However this did not completely solve the problem. 360 Blue says they are planning to do a full extermination after we leave which will solve the problem for everyone in the future but left us stomping bugs for the week. One final note, none of the bicycle helmets fit me so if your an adult with a larger head, bring your own! What a stunning photo! Can't beat those gorgeous views! We are so sorry about the pest problem you had during your stay. With all of the rain we've had lately, it unfortunately tends to bring them out more. We do routinely spray all of our homes for preventative maintenance. We are happy to report, we did send out our 3rd party pest control company upon your departure and have resolved that. Thank you for staying with 360 Blue and we hope to have you back again soon! We had a great stay at "A Wave from it All." 360 Blue provided the best non-owner experience we have ever had and we have rented big houses for 20 years. Our groups would love to return but the trucks on the beach might be a deal-breaker for us. Even if you set up early to claim your spot they park so close you have to move. The beach was terrific and the view was incredible from the house. Overall a great experience. We are thrilled that you loved this amazing home as much as we do. So sorry to hear that the vehicles on the beach made your beach days anything less than perfect! We certainly hope that our beautiful white sand and emerald waters helped to make up for that. We hope to see you all back soon! Great house! Location is very busy. Cars are allowed on the beach and became busy with moving cars at times. What a beautiful day for the beach! We are so happy you had such a great stay! We do apologize about the busy public beach. It is a popular spot on 30A, but we hope you were still able to make some amazing memories at the beach! Thank you for staying at 360 Blue and be sure to think of us for your next vacation! Wonderful home. We enjoyed the close access to the beach, beautiful sunsets, and close access to local restaurants. Had a wonderful time and will definitely be back. The grandkids cried when we left. That photo is absolutely breathtaking! We are overjoyed to hear how much your family enjoyed staying, we hope you made memories to last a lifetime. Hope to see you again very soon! Wow! This is the way to go to the beach! We thoroughly enjoyed our stay at \"A Wave from it All\". Our group of eight had plenty of room to spread out and enjoy our time at the beach. Everything was clean and ready to go when we arrived, and the communication with 360 Blue ensured that we had everything we needed. The main living area on the top floor was perfect for big groups and family meals, and the spacious bedrooms and plentiful balconies made it easy to find quiet space. Some unexpected pleasant surprises were the elevator, the ice machines, and the heated pool! It was also nice having a couple of great bars/restaurants within 100 yards of the property. All in all, a fantastic stay! Hope to be back soon. Sounds like you were really able to take advantage of everything this beautiful home and incredible community have to offer. 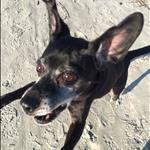 We love Grayton Beach and A Wave from it All and we are thrilled that you do too. We look forward to having you back soon! We are thrilled you enjoyed the home so much! Such a beautiful photo! We apologize for the inconvenience of the vehicles on the beach. Being that it is such a popular area on 30A, it does stay somewhat busy. We hope you were still able to enjoy your time on the beach and make some amazing memories. Thank you for staying with 360 Blue and we hope to have you back again soon!